This entry in our “De-Provincializing Development” series examines SDG #15: Living on Land. Not long ago, when companies from Google to British Petroleum were busy rebranding themselves, Fast Company Design asked visitors to its website to decide which corporate logo was most in need of a makeover. Respondents zeroed in on Sherwin-Williams, the US-based manufacturer whose logo depicts a can of paint spilling its “Cover the Earth” tagline onto a globe whose meridians are fast disappearing under a coat of bright red. In a gesture at once provincializing and de-provincializing, the globe has been knocked sideways off its north-south axis. Sherwin-Williams’s Big Red Paint Pour originates at the top from its corporate headquarters in the Americas, with the African and European continents jointly relegated to the bottom as potential markets in the path of crimson drops. A mid-twentieth-century version of the Sherwin-Williams logo. Source: Flickr. Back in the day, a logo like this evoked the transformative power of industry in ways that struck customers as positive, even triumphant. But in these more environmentally conscious times, poll respondents contended, the imagery comes across as ecologically destructive. “Cover the earth . . . in paint?!? That’s healthy,” one commented drily. “PRO-pollution,” said another. An “ominous brand,” asserted a third, that brings oil spills to mind with its call to smother the Earth in “goop” (see Barrack 2011). Such an eco-oriented consensus could only emerge in an age ostensibly more enamored of biodiversity (and irony) than colonization. About that irony: A century and a half after Northern industrialists like Henry Sherwin proposed to usher the Earth’s inhabitants into modernity with paints, soaps, and varnishes, the United Nations set out to cover the Earth once again in its Sustainable Development Goal 15: Living on Land. Only this time, the color designed to stir the heart to action was not red, but green. Protection of terrestrial ecosystems, sustainable forestry, an end to land degradation and desertification: noble endeavors all, and sorely needed. The text of SDG 15 lays out these aspirations without the slightest mention of green as such. Yet a green aesthetic, much critiqued by writers on ecology of late, creeps in through the language that describes how these ends are to be achieved and through the indicators adopted to evaluate progress toward reaching them. What imbues this prescription for Living on Land with a green aesthetic, and what makes that aesthetic troubling, even as there is something deeply worthy in reaching for things listed in the goal? A green aesthetic, broadly conceived, once sent certain environmentalists down the fortress-ecology path of attempting to protect discrete pieces of land by drawing boundaries around them, evicting established communities, and restricting access in order to manage those parcels as greened-up human-free reserves (Brockington 2008; Dowie 2011; Igoe 2003; Spence 2000). Only later, after much displacement and suffering, did environmental studies begin to appreciate how Indigenous communities, especially, had coproduced the thriving ecosystems others took to be “natural” (see Anderson 2005). In order to encourage new growth and prevent calamitous fires, for example, many groups periodically relinquished green to blacken the land using controlled burns. A green aesthetic has also inflamed class tensions in urban areas. Developers and beautification campaigns have used green rationales to raze slums (e.g., Ghertner 2011). In parts of the Global South, ecologically minded middle-class citizens endanger poorer residents in the name of curbing pollution by dousing the small roadside fires that allow people to cook food and stay warm. If all that glitters green is not as it appears, so, too, green is not green is not green. The color-coding that has rallied people to “eco” causes obscures important qualitative differences about what is happening to the land. Take the US, whose official website on national progress toward the SDGs records forest area increasing from 33.7 percent to 33.8 percent of total land area from 2010 to 2015. Even that tiny increase seems like something to celebrate. Yet this way of calculating misses the threat that wildfire poses to those very forests in an era of climate change, when increasing temperatures combine with drought and insect infestations to devastating effect. Millions of acres of managed forest in North America have disappeared in a flash. Fires that burn too hot may not have the usual regenerative effects. Pines in arboreal forests cannot reappear when their seeds are completely incinerated. The quality of the water piped to cities from forested areas may be affected for years (Struzik 2017). Statistics on forested area cannot gauge whether a particular stretch of forest is resilient enough to survive this kind of firestorm. The color-coding that has rallied people to “eco” causes obscures important qualitative differences about what is happening to the land. A green aesthetic also makes it difficult to determine where exactly ecological benefits lie. The impervious hydrophobic soils that megafires create may green back up with shrubs, yet they allow less groundwater recharge than permeable asphalt. That same green aesthetic makes it hard for many onlookers to discern life in the sepia tones of a desert. The thorn forest that borders India’s Thar Desert is sometimes described as degraded, but it shelters leopards, chinkara, bats, hundreds of bird species, and has its own look. Cover the Earth: the color may have changed from manufactured red to eco-friendly green, but the totalizing ambition remains the same. Equally familiar is the managerial stance embedded in the language of SDG 15, brought forward from an era of industrial expansion and now deeply rooted in an ethos that urges the privileged to trade the mantle of conquest for the robes of land reclamation, styling themselves protectors, restorers, users (still), and even combatants engaged in a struggle to master the changes to ecosystems that earlier generations set in motion. As though efforts to undo the worst excesses of the so-called Anthropocene depend on placing humans (still) in the driver’s seat of resource management programs and soon-to-be-electric cars. Success to be gauged using rough measures that include the Mountain Green Cover Index. “Sustain” can mean to perpetuate as well as to nourish. Land reclamation still positions the claim at its heart. In that sense, an SDG framed as living on land, however lightly, can perpetuate a colonialist stance. What would it take for green cover to amount to more than some neoliberally inspired insurance cover for future generations? Imagine an SDG de-provincialized enough to approach land as a teacher, in the way that Soren Larsen and Jay Johnson (2017) discuss with regard to Indigenous understandings of life. Learning from land, living with land, instead of perching on it, still gives humans plenty to do. With climate change, deserts—like forests—are on the move. Perhaps working with the desert instead of treating it as an enemy would yield different outcomes for farmers whose soil can no longer yield crops. Maybe those sugar maples slowly migrating north need an assist (see Kimmerer 2013). Maybe “artificial glaciers” in the Himalayas will turn out to make sense. But we have to take such steps more humbly, in relationship, not as green overlords who make new sets of claims on the land while handing down directions from above. Listening, seeking, guiding, because green is not green is not green. It depends. An SDG framed as living on land, however lightly, can perpetuate a colonialist stance. What would it take for green cover to amount to more than some neoliberally inspired insurance cover for future generations? And yet. Addressing the lethal pressures that business-as-usual places on life and land will require more than a sense of alternative ways to live explored by anthropologists. 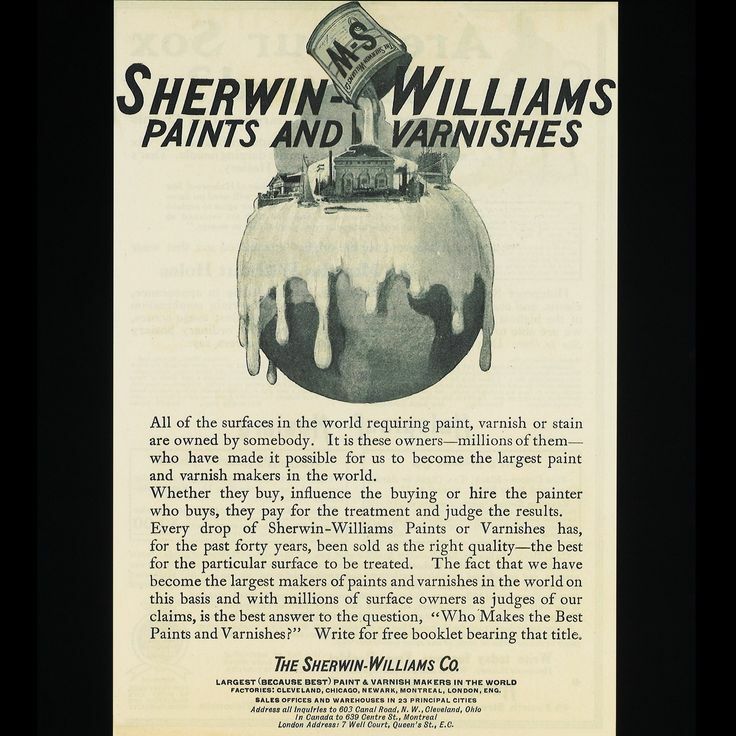 One early Sherwin-Williams advertisement attributed the company’s success to the fact that “all of the surfaces in the world . . . are owned by somebody,” giving owners control over decisions to apply paint and judge the results. All of the surfaces in the world are still owned by somebody. Listening, seeking, and guiding will not be enough. Kath Weston is a professor of anthropology at the University of Virginia and the author of Animate Planet: Making Visceral Sense of Living in a High-Tech Ecologically Damaged World. Founded in 1866, Sherwin-Williams went on to became a “global” brand whose products are still difficult to find in much of Africa and Europe. Image here. Accessed January 13, 2018. Anderson, M. Kat. 2005. Tending the Wild: Native American Knowledge and the Management of California’s Natural Resources. Berkeley: University of California Press. Barrack, Rick. 2011. “You Asked, and Rick Answers: A Revamp of the Sherwin-Williams Logo.” CO.DESIGN Newsletter, April 8. Accessed January 6, 2018. https://www.fastcodesign.com/1663585/you-asked-and-rick-answers-a-revamp-of-the-sherwin-williams-logo. Brockington, Dan. 2008. Nature Unbound: Conservation, Capitalism, and the Future of Protected Areas. New York: Routledge. Dowie, Mark. 2011. Conservation Refugees: The Hundred-Year Conflict between Global Conservation and Native Peoples. Cambridge, MA: MIT Press. Ghertner, D. Asher. 2011. “Green Evictions: Environmental Discourses of a ‘Slum-Free’ Delhi.” In Global Political Ecology, edited by Richard Peet, Paul Robbins, and Michael Watts, 145–65. New York: Routledge. Igoe, Jim. 2003. Conservation and Globalization: A Study of National Parks and Indigenous Communities from East Africa to South Dakota. Belmont, CA: Wadsworth. Kimmerer, Robin Wall. 2013. Braiding Sweetgrass: Indigenous Wisdom, Scientific Knowledge, and the Teachings of Plants. Minneapolis: Milkweed Editions. Larsen, Soren C., and Jay T. Johnson. 2017. Being in Place: Indigenous Coexistence in a More Than Human World. Minneapolis: University of Minnesota Press. Spence, Mark David. 2000. Dispossessing the Wilderness: Indian Removal and the Making of the National Parks. Second edition. New York: Oxford University Press. Weston, Kath. 2018. “Cover the Earth: Reclaiming Life and Land through the Prism of a Green Aesthetic.” American Anthropologist website, June 12.